The unjust jailing of anti-fracking protesters in the north of England (which happily has provoked a new wave of resistance to the toxic industry) has highlighted a fundamental flaw in our supposedly “democratic” society. 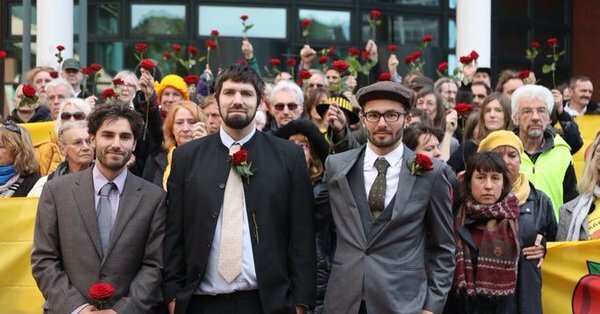 The #FrackFreeFour (three of whom are currently in jail) were acting in the interests of the public and the environment, for a cause supported by most of the public and in a defiant yet non-violent way that meets with general public approval. If we really lived in a democracy, as we are always told we do, they would not have had to take the actions they did in the first place, let alone land up in prison. But the trouble is that our society’s supposed commitment to “democracy” is flimsy and merely theoretical. In practice is always trumped by the conflicting notion of “authority” which will always prioritise the interests of the tiny minority which possesses wealth and thus power. Even when authority is supposedly invested in the public, in a “democratic” society, it can never be left to emerge from below in a natural sort of way. Instead there must be structures which theoretically transmit the opinions of individuals through complex filtering systems of representation until they pop up at a level of power above that of the individual or even the community, in the form of a new kind of authority, a “democratically-elected” authority. One cannot argue with this kind of authority, any more than one could argue with the old kind. In fact, it is an even worse sin to deny its divinity, as by doing so one also denies “democracy” and the supposed rights of citizens to shape the world in which they live. Faced with, for instance, the risk of some horrific industrial process poisoning their water supply, citizens of a “democratic” state are not supposed to simply get together and stand in front of the building site to stop it going ahead. If they do, they will be punished by Authority for not following the rules set down by Authority. They should have gone through the proper channels. They should have somehow voted somebody into Authority who wasn’t going to allow this thing to take place, or they should have formed their own Authority-respecting political party and stood for election in a bid to become Authority themselves and stop the thing from happening. If they haven’t done that, then all they can do now is to write to those who do represent Authority and beg them, in a respectful and humble tone, reflecting their own innate unworthiness, to change their minds. If they go ahead and defy Authority, then Authority has, of course, the right to lock them up. This is a right that Authority has awarded to itself. And since a critical mass of people seem to accept that it has that right, it can essentially behave as it wishes. People are also taught to be afraid of what would happen if there were no Authority any more, nobody to make and impose the rules, nobody to look up to and fear. The idea of people reaching decisions themselves on a communal level, without any interference, is regarded as absurd.